Prepared for your edible pleasure by Brooklyn artist Rumi Tsuda and her husband/fellow artist, Danny Georges with able-bodied Stephen Ocone at the griddle. 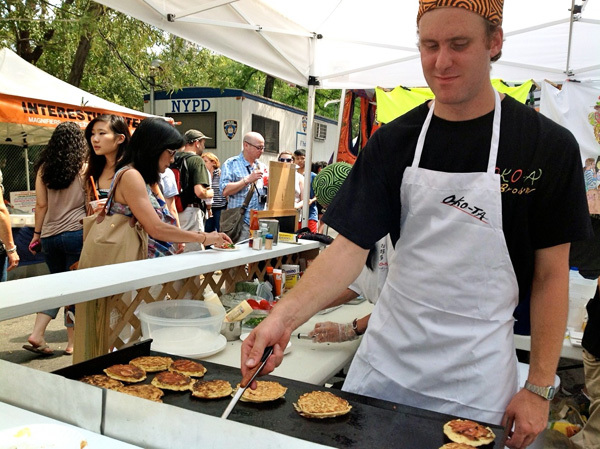 OKO - TA has served OKO at food events and fairs since August 2012 including West 4th St. fair, 4th Avenue fair, Hester Nights, Willifest, Hester St. fair, Japan Block fair, Bryant Park Movie nights and Grub Street Food Festival . All OKO start with a wheat flour and egg batter with fresh chopped cabbage cooked on an iron griddle. Shrimp or Bacon can be added just after the batter hits the grill. When the OKO is cooked to perfection with a crisp outside and a tender, but deliciously crunchy-with-cabbage inside, it is topped with Rumi's visual flare by our special savory brown and white sauce, fresh scallions, pickled ginger, and dried bonito flakes to create a rich harmony of textures and flavors. 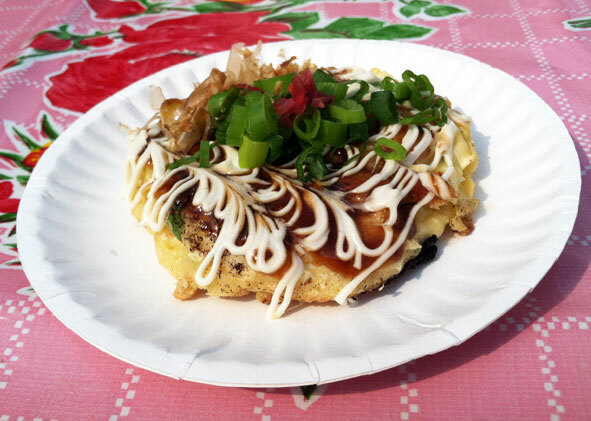 What we call OKO for simplicity go by the full name of Okonomiyaki in Japan. They are popular at outdoor festivals prepared at stands like ours. They are also found in small casual restaurants frequented by students and people who want something tasty, filling and inexpensive, often prepared by the patrons themselves on a griddle built into the table or bar. They go great with beer. 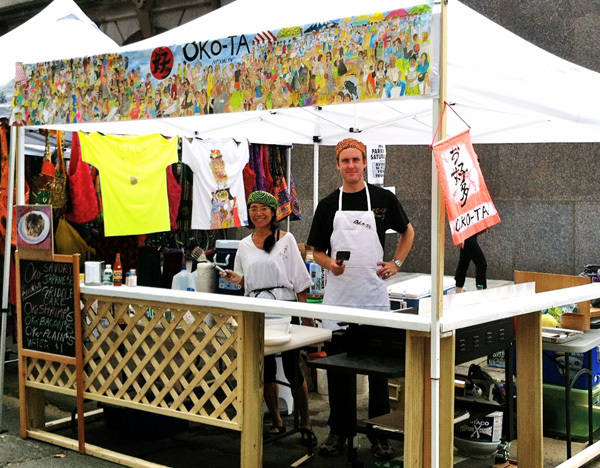 OKO - TA (お好多) translates from Japanese as "more of what you like." 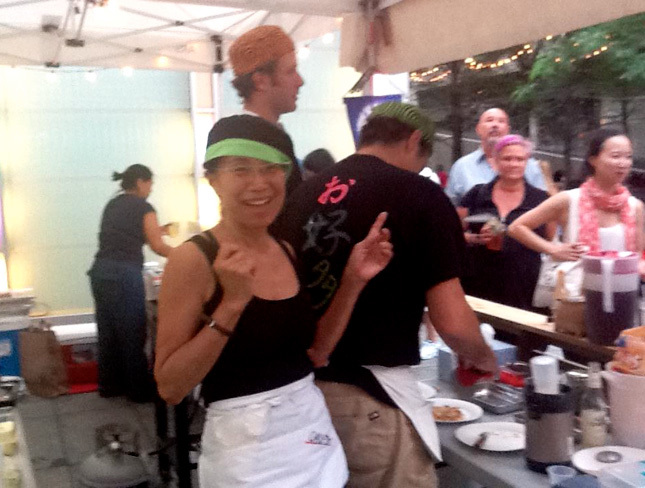 OKO - TA is the first food venture by Rumi and Danny. Rumi has always had an excellent sense of style in her cuisine and life, and worked as a waitress and caterer in her student days. 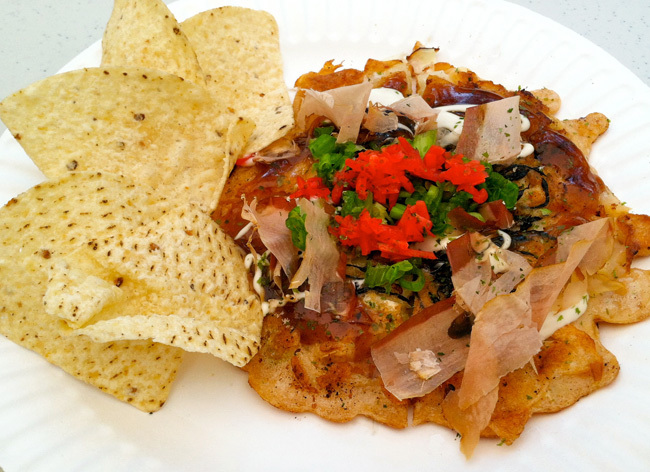 For OKO - TA, Rumi went to Osaka to attend special training in the preparation of Okonomiyaki. Rumi is an accomplished artist and painted that nifty banner of the crowds at the fair in Williamsburg. Danny is a sculptor, builder, and lover of Japanese food. Rumi and Danny met in the MFA program at School of Visual Arts. Rumi hales from Wakayama-city near Osaka, Japan and Danny grew up in Portland, Oregon. They have been in Williamsburg, Brooklyn since the 90's. Stephen is a Rutgers grad and recent transplant from New Jersey to pursue the good life in Bushwick. See you at the fairs! 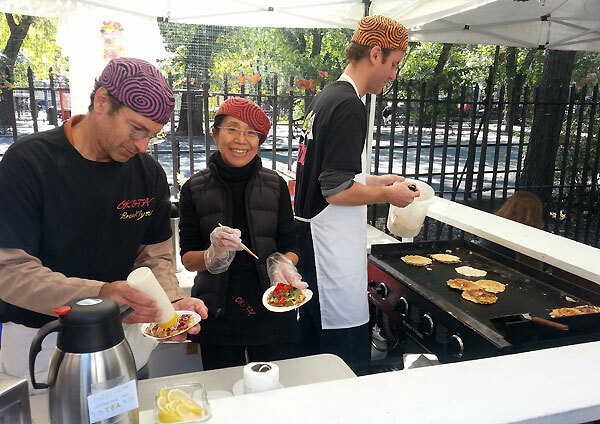 To get news about our current events visit facebook.com/okota.food and "like" our page.